Self portrait at about age 60. Even though Leonardo da Vinci is primarily thought of as a painter, he made many contributions to science. His greatest talent was in accurately observing and recording the world around him and most of his surviving work is mechanical, anatomical and architectural drawings and manuscripts. His main concern was always how things worked and he used his eyes to see how things were made and then record them in such a way as to make it clear as to how they functioned. For da Vinci, art was a tool for discovery and invention, whether it was to detail how the human hand works or to create a prototype of an airplane or helicopter. Leonardo spent much time in Florence where he dissected bodies in the St. Maria Nuova hospital, recording the position and shape of organs as well as trying to figure out what they did by analyzing their structure. During his lifetime he worked on 30 bodies. Leonardo da Vinci's design for an aerial screw. He was also fascinated with the flight of birds and how humans could fly, drawing several human-powered flying machines. He saw air as a medium with properties similar to water, such as current. His drawings of pumps and screws show that he understood how these machines could interact with a fluid. Leonardo’s design of a helicopter was based on a screw that would propel itself upward through the air. Leonardo was also the first to explain why there is a ghostly image of the full Moon whenever there’s a crescent Moon on the horizon at sunset. Astronomers call it Earthshine and Leonardo correctly attributed it to our own planet reflecting light back to us from the Moon. Yet Da Vinci’s legacy goes beyond his drawings and discoveries. He showed that inquisitiveness together with observation can reveal how things work, and how that information could be used in the creation of buildings, machines or inventions. 1) True or false: Da Vinci had a good understanding of fluid dynamics. 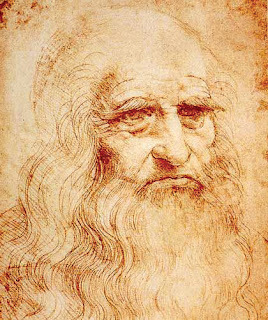 2) Most of Leonardo da Vinci’s surviving work is of ___________________________. 3) True or false: Leonardo dissected a few bodies to further his understanding of anatomy. 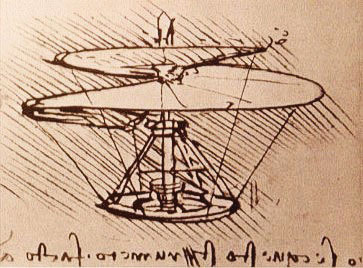 4) Many of Leonardo’s inventions were ______________________. 5) Reflected light from Earth that is visible on the Moon’s night side is called __________.